Maya Dusenbery has added immensely to the literature on women’s health in her important book Doing Harm by addressing the two biggest impediments to women getting good care: “The knowledge gap and the trust gap.” The knowledge gap refers to the fact that doctors simply don’t know enough about women’s bodies, their symptoms, or the diseases that affect them disproportionately, while the trust gap speaks to the stereotyping of women as unreliable reporters at best, and hysterical at worst. Her central and necessarily often repeated mantra is that women are either not trusted when they report symptoms or they are labeled crazy, malingering, or opioid addicted. These biases are revealed over and over again as women share their first-person horror stories of trivialization, misdiagnosis, not being believed and more, whether they suffer chronic pain, autoimmune diseases, reproductive problems, heart attacks or other life-threatening emergencies. Copious references to research studies and other books in the women’s health canon support women’s stories, and expose “bad medicine and lazy science” in compelling and convincing ways. 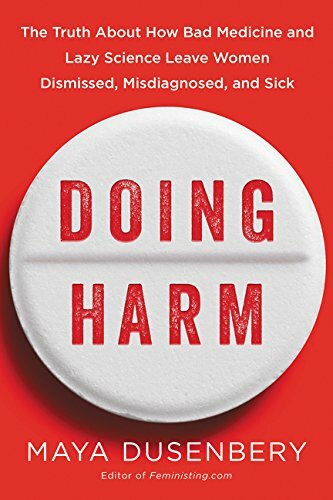 Women’s health activists will find much of what Dusenbery writes about familiar and validating, while younger readers will be exposed to information they desperately need as they increasingly interact with healthcare providers and institutions. Chapter subheadings help to nail the problems being addressed. “Doctors think that men have heart attacks and women have stress” speaks to the frequency with which women are told their symptoms are due to stress, a theme played over and over again in the stories women share. “This is not normal,” reveals how often women must insist on having diagnostic workups. Concluding her book, Dusenbery speaks to “challenging the power of medicine . . . in a medical system with a tendency to assume that anything it can’t explain is psychogenic.” She encourages women to trust themselves and the knowledge they have about their own bodies, and to share their stories with other women in order to be validated and informed so they can “overturn entrenched expert opinion.” She encourages them to “find allies within medicine.” She applauds patient advocacy while calling upon funders, scientific journal editors, and researchers to get onboard. Her final message? “Listen to women. Trust us when we say we’re sick. Start there, and you’ll find we have a a lot of knowledge to share.” Doing Harm goes a long way in arming women for the task.